The term "digital convergence" means the ability to view the same multimedia content from different types devices and thanks to the digitization of content (movies, pictures, music, voice, text) and the development of connections methods. 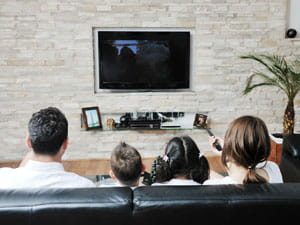 Readimg emails on your TV via a connected smartphone, watch a streaming movie on the home theater connected to the Internet ... Digital convergence simplifies our life into our living room. Formerly, each unit operated independently and networks were not interconnected. Today, information flows on the same network and are stored, read, viewed or listened via same types of equipment. Networks, technologies and content converge on a single device. Result: it saves time and simplifies life. Now your TV can provide access to all information on a single screen. For example, a LED TV easily connects to a game console, a computer, Blu-ray players and also Internet router, allowing you to access your mail directly from your living room! Now even your Smartphone can be connected to your screen. This is the case of Apple, with the i-Cloud application that connects TV-PC-Smartphone. You can share videos, photos and applications wirelessly. Original document published on CommentÇaMarche.net. Published by deri58. Latest update on September 18, 2012 at 05:35 AM by deri58. This document, titled "What is Digital convergence?," is available under the Creative Commons license. Any copy, reuse, or modification of the content should be sufficiently credited to CCM (https://ccm.net/). The social recommendation: a new challenge for businesses!